If stunning looks and powerful performance were one, it would be called 4 Air. A fan from the house of V-Guard, the V-Guard 4 Air is one of the best looking products from the elaborate range of V-Guard's home appliances. Its dual tone vibrant colour combination gives your ceiling a classy look and blends perfectly with dual tone interior room decoration. The fan has four blades that provide less pulsating air thrust to the Customers, otherwise air will be having streamline flow i.e. better performance or air delivery. So, if you need a smart looking fan for your living room, then this V-Guard 4 Air might just be what you are looking for. 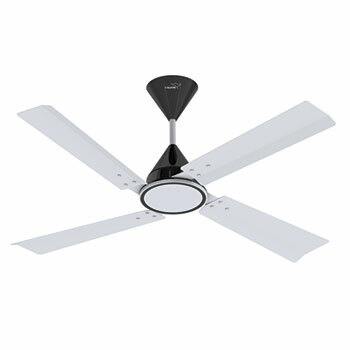 The V-Guard 4 Air fan is a unique fan with four blades to provide effective cooling to your room. It has exotic body ring that gives it a classy finish. 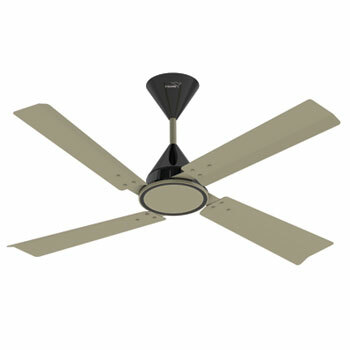 The 4 blade ceiling fan is a great choice for larger sized rooms as well. With the known durability, stunning looks and exceptional performance, this V-Guard fan is designed for prolonged performance and can be a great choice to spice up your home and stay cool this summer.